January: The trio issued a new single on January 20th. It appeared in both 7" and 12" forms. The former featured Warhead and Lady Lust and did come in three different picture bags. A very few copies were also made in blue vinyl. 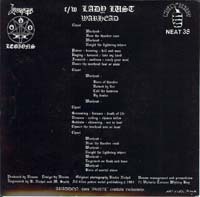 The 12" version (available with one sleeve only) contained an extended rendition of Warhead, Lady Lust plus Seven Gates Of Hell. The single debuted on number 3 in the HM chart and stayed in the top 30 for 15 weeks. This release led to a monumental episode in the history of Radio One, when Tommy Vance conspired (by offering to pay sum of money to charity) to get the not-very-radio-friendly A-side played during daytime programming, to the distress and bewilderment of many sensitive souls. Chortle. There was also talk about doing a video in Paris to promote the Warhead single, but it was scrapped. February: The 7 Date Of Hell Tour or At War With Europe as it was called at an early stage was iniended to be held at the folllowing places and dates: Zurich (Switzerland) Feb 3rd, Vienna (Austria) 5th, Nuremburg (Germany) 7th, Paris (France) 9th, Aardschokdag in Zwolle(Holland) 11th, Poperinge (Belgium) 12th and Birmingham (England) on 14th. But two dates were changed. 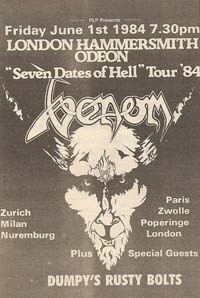 Venom were not allowed to play in Austria because of their satanic lyrics and that date were changed to a gig in Milan (Italy) and the british date were rescheduled to London May 28th but was later and finally altered to June 1st. All february concerts were supported by Metallica. 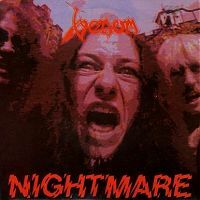 March: Venoms third album At War With Satan arrived on March 16 and found the Geordie triumvirate taking huge strides forward, especially abroad, where the semi-conceptual LP greatly increased the band's following. Europe took the band in dedicated fashion. The album reached number 4 in the HM chart and stayed in the top 50 for over 7 months. April: The album did run into trouble in England. The HMV record chain (one of the biggest in the country) withdrawn it from the shelves due to its controversial nature. According to a spokesman for the company: "We are seeking legal advice on its contents and until such time as we receive a reply it won't be available at any of our outlets" And WH Smith (another big record chain) did take a similar action. Venom's manager Eric Cook responded to this move: "This is ridiculous. The album is no more controversial than our last one. This decision has really messed us up." 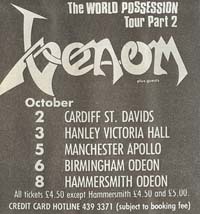 June: Venom played their first UK-gig, a much-heralded show at Hammersmith Odeon which was attended by a significant number of personalities from the music scene at the time, as well as some fanatical followers who had waited several years for this opportunity. The lads made good use of this prestigious gig, capturing the show on both audio and video tape, the latter being used to form the basis of their "7 Date Of Hell" video-release in due course. 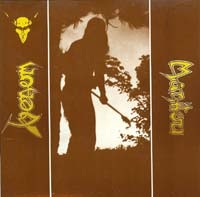 October: Venom issued a new single, Manitou, in October. Neat really went to town with this release, issuing it on virtually every format known to mankind (7", 7" picture disc, 12", shaped picture disc and cassette single). Woman was on the flip and the 12" formats also contained Dead Of The Night. The single debuted at number 8 in the HM chart and reached it's highest position at number 3. It stayed in the top 30 for 5 months. 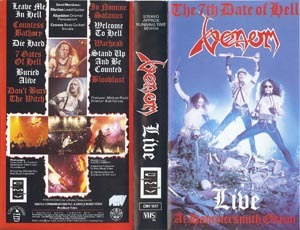 November: The live video filmed at Hammersmith titled The 7th Date Of Hell - Live At Hammersmith Odeon was released on the Neat label (distributed through Virgin). The video contained 11 tracks and the running time was 57 minutes. 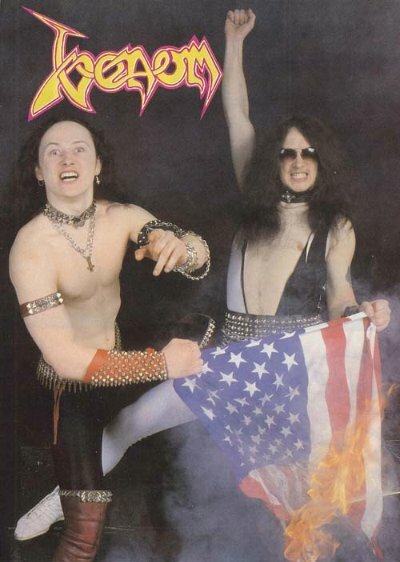 December: Cronos, Mantas and Abaddon found themselves riding high in this year's reader's poll in Metal Forces (THE metal mag for METAL fans at the time). 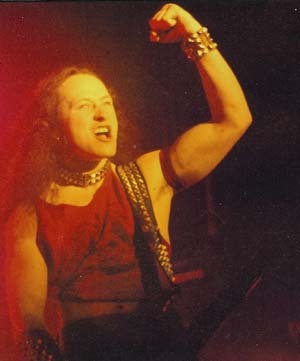 Manitou and Warhead appeared as the fourth and fifth best single of the year, with Venom clocking in both as fourth best band and best live act. But as always, Venom was not for everyone, which showed in Kerrang! :s version of the poll. Here they had been dubbed Worst Band Of The Year from the readers. 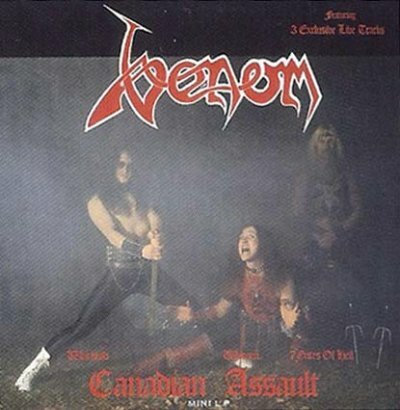 January: At this time Venom are big business in Canada and America. Before the band heading overseas for a tour they release a Mini-LP, Canadian Assault through Banzai Records (a Canadian label, specialized in licencing releases from USA and Europe for the Canadian market). The album has three tracks from their singles and on the flipside is three livetracks from the Hammersmith Odeon concert the year before. The album soon turns platinum (100,000 copies sold) in Canada and quickly rises high in the charts for Imports album in Europe. March: The North-american tour beginn disastrously for the band. The first inkling of trouble occurred shortly before the band werre due to fly out to Canada when Mantas fell seriously ill with a mixture of glandular fever and chicken pox. 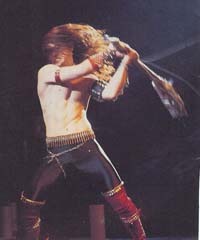 Scheduled shows were immediately postponed for two weeks (the gap between the Canadian and American dates effectively reduced to zero), but Mantas condition worsened, leaving the band with no option but to play the shows with stand-in guitarists, both local Newcastle lads, Les Cheetham (from Avenger) and Dave Irwin (Fist). Couple this calamity with immigration hassles, last minute permits for the new boys, and only 48 hours rehearsal and you can understand why the Venom road show trundled off to a fairly subdued and severely dispirited start. 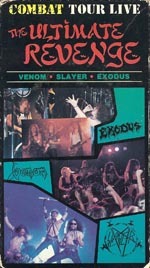 Neverless, the actual shows in Canada, all held in large 3 000-4 000 seaters, proved to be real killers, drawing a remarkable reaction from both band (determined not to blow it) and audience, even though there had been literally no time to inform the fans of the line-up shuffle prior to the actual gigs themselves! More trouble! Mantas should have arrived in New york, ready to hitch up with the band and play, at perhaps the most strangest and possibly prestigous gig of the tour - Studio 54, the most famous disco hall in the world, which was popularised by the movie, Saturday Night Fever. Located in the heart of Manhattan, within vomiting distance of Empire State Building, the club had just been opened as a rock venue with Venom the first band to play there. But, although his illness had been overcome, he was the victim of a massive clerical balls-up instigated by HM Government over the whereabouts of his passport. In short he was stranded back in Newcastle and was not back in business until two days later for the gig in Chicago on April 5th. 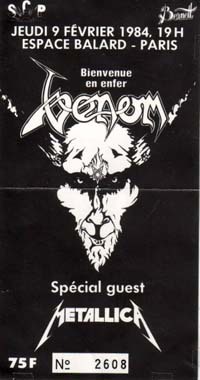 All in all Venom played 13 concerts on this tour between March 24 and April 28, 4 gigs in Canada and 9 in USA. Unfortunatley the crowd was not exposed to the mayhem the band has prepared for because there was not enough stage space to accomodate the exorbitant ammount of lightning and pyro, so sacrifices was to be grudgingly made at almost every concert. April: On April 1 Venoms fourth longplayer was released, Possessed. 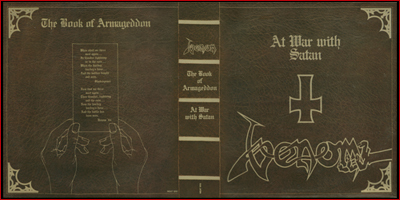 An album that was planned before the At War With Satan LP, in fact a lot of it was written at the time of the Black Metal album. It was always planned to have a collection of shorter punchier songs, and so it was made. The guitars was again laid down at Impulse Studios but Abaddon took some time finding a place with exactly the right sound for his drums. In the end he went to Sussex, to a place called Moor Hall. 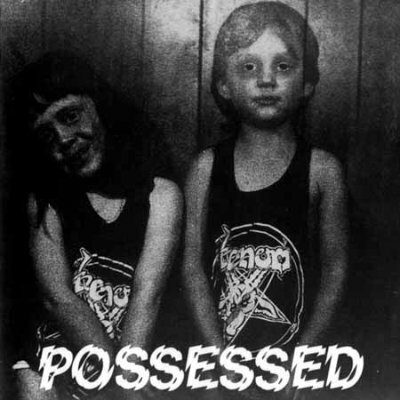 The album cover features two infernal progency children there standing in Venom Welcome To Hell shirts smiling diabolically, displayed in negative form but didn´t turn out the way the band wanted it to. It was gonna be another gatefold sleeve with these kids on the front, then when you opened it up there'd be toys covered in blood and guts. The way it turned out it did not tell the story the way it should and basically the reason for that was because the LP was rushed into the shops. More about the story around the cover - Venoms engineer Keith Nichol had given some Venom shirts to his brother, Richie Nichol. Richie took them home and his daughter put one on, and then Richie, a photograper, later suggested to Abaddon, that they get Richie´s daughter and Abaddon´s son, who were about the same age, to wear the Welcome To Hell T-shirts for a photo shoot. So they did, and one of the Photo negatives was used on the album front cover. The album entered at number 7 in the HM-charts and stayed in the top 30 for three months. In other countries, like Sweden, they did even better. Possessed entered the Swedish chart (for Hard rock albums) at number two. Simultaneous the importalbum Canadian Assault was at number four. 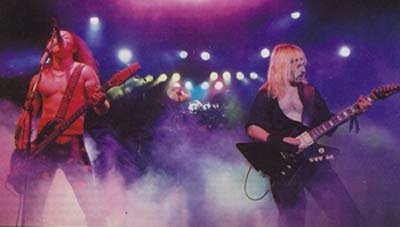 May: A high point in ´85 was their notorious performance on Channel 4´s weekly metal show of the period E.C.T. (Eric Cook Television). 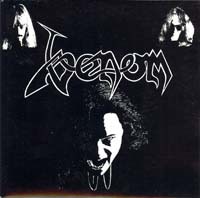 Venom made their appearance on May 31 in a jammed beyond capacity studio, attracting the largest audience of any of the shows and making a mockery of the whole glossy image of TV. Given barely ten minutes, they ripped through Too Loud For The Crowd. 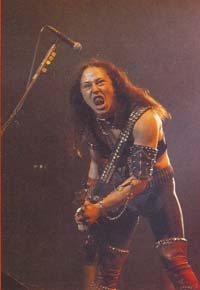 Nightmare and Die Hard (which famously ended With Cronos diving headfirst into the crowd, bass still attached! ), with devastating ferocity, detonating more explosives than all other bands in the entire series together. A truly monumental performance. 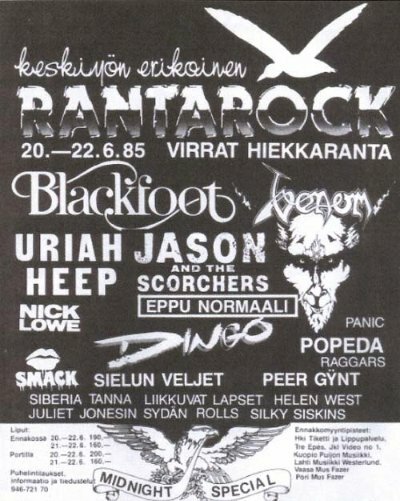 June: Venom headline the Rantarock festival in Virrat, Finland on June 21. The guys really enjojed the gig, much because the festival was located by the sea so they had no problems to get admittance to use a lot of fireworks and explosions. July: Raw Power is releasing the first compilation album with Venom. A double album called From Hell To The Unknown. The first two sides are merely Welcome To Hell re-issued, but sides three and four have not only familiar studio-smashing lunacy tracks it also have rare live versions and the previously unavailable ball-breaker, Senile Decay, plus the hilarious radio interview with Geordie DJ Alan Robson. 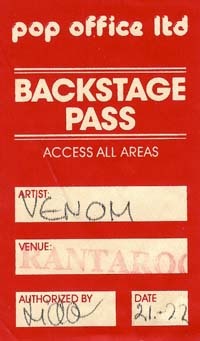 August: On the 2nd of August Venom performs a session for the Friday Rock Show on Radio 1. The lads ran through blistering versions of Black Metal, Nightmare, Too Loud For The Crowd and Bloodlust. September: A new release hit the stores on September 6, a single based around Nightmare, a number the outfit had been showcasing a great deal already (played live on the World Possession tour part 1, USA and Canada and on TV/radio shows). Once again, this single was to appear in multifarious formats, including a picture disc which barely made it into the shops, a picture sleeve for the 12" version (showing a horny creature getting up some real naughtiness on a four-poster bed) which was withdrawn after a bit of fuss was kicked up by someone-or-other, plus the usual motley array of shaped discs and cassettes. Still, the odd bit of controversy never did sales any harm, and the release itself was of highest standard. It debuted on number 10 in the HM-chart and stayed in the top 30 for two months. On saturday, the 13th of September, the band headlined the Metal Hammer Festival in Loreley, Germany in front of 12.000 people. It was a day of much trouble. The contract with the promoters was specifying £5.000 of fireworks that the promoters should arrange. However, when the band arrived in the afternoon they realized that nothing had been prepared for the show. Venom threaten to cancel their appearance and soon the police was informed about the situation.They feared a riot and the promoters was instructed to buy and install fireworks. Finally, slightly deleated, Venom did enter the stage and delivered a show that the crowd expected and deserved. The whole event was filmed and later broadcast (in form of selected highlights from all festivalbands) on German television. A couple of months later Channel 5 released this on video, featuring Seven Gates Of Hell, including Crono's bassolo. October: The British leg of the World Possession tour part 2 begins in Newcastle 3rd and follows with three more gigs culminating with an appearance at the Hammersmith Odeon in London. The band, as subtle and sedate as ever, was using a gold Rolls Royce as a tour bus, and did spend £1,000 per gig on pyrotechnics alone. From the beginning there was a ten date tour set up but due to the smallness of some places they where not permitted to use pyrotechnics and therefore decided to cancel six dates. The tour continues with 17 gigs spread over two months in Italy, Germany, Denmark, Holland and France. November: In the autumn the market was overflowed with more Venomreleases. Arrived did the second and third instalment of the famous series of Assaults, which were supposedly conceived as a strictly-limited souvenir of each of their overseas jaunts, but which eventually started to be churned out on a regular basis in order to fleece their loyal fans around the world. 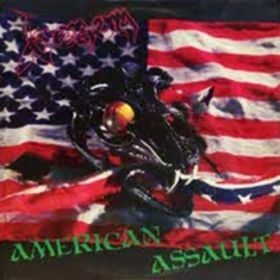 American Assault was released by Combat records in USA and followed the same arrangement as the Canadian Assault. Three studiotracks and three livetracks taken from the Hammersmith Odeon concert 1984. 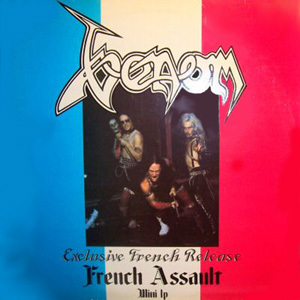 The exklusive french release French Assault had two very interesting inclusion, Nightmare and Bloodlust both taken from The Friday Rock session in August. 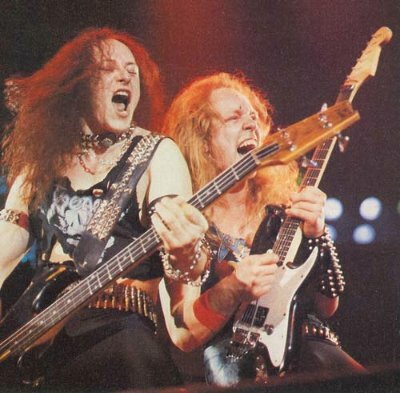 Combat also released a video called The Ultimate Revenge with clips, both live and interviews, of dukes of Heavy Metal darkness, Venom, Slayer and Exodus about their evening of April 3 when Studio 54 in New York changed it´s disco gloss to heavy metal sweat. 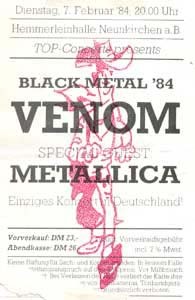 Due to Mantas absence on that occasion no liveclip from Venoms appearance that night is included in the video. December: Once again, their Hammersmith Odeon appearance had been taped for a live album and video release. 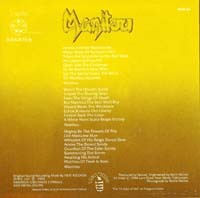 As it happens, the live album was shelved for almost 12 months and augmented prior to its release by material from recordings made at the Ritz in New York the following year, but a limited edition 12" EP entitled Hell At Hammersmith was rush-released in December in time for the Christmas market. The EP featured Witching Hour as the A-side and the Teacher´s Pet / Poison medley on the flip. 14 tracks from the show made it to the Videorelease.